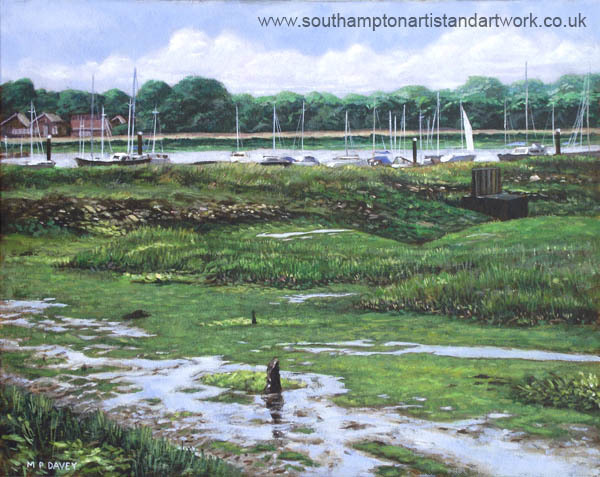 This painting is of the River Hamble, near to the Solent and Southampton, in the UK. It is based on a view photographed during the spring of 2012, and features a view of the marina, near the town of Warsash, packed full of boats. There are a number of marinas down the river. The land is very flat and when the tide goes out the mud flats are revealed, showing a covering of moss and algae, with pockets of water isolated from the river. The River Hamble contains many old shipwrecks of archaeological importance. I was drawn to this scene for my painting by this strong, green landscape, that only appears for part of the day and the way that puddles of water remain creating their own small rivers through the landscape. This painting is created in acrylic on a canvas measuring 20" x 16".